Lysimachia Golden (more commonly known as Creeping Jenny) is a vining plant known for its yellow leaves and cascading growth habit. 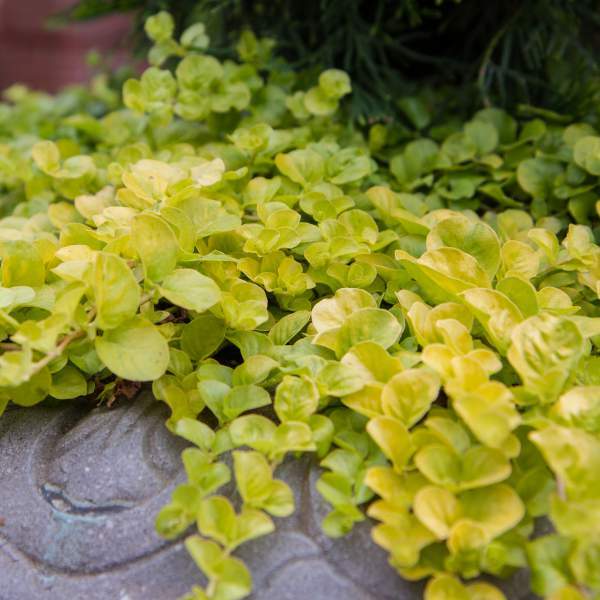 Known more for its foliage than its flower, in warmer climates Creeping Jenny is evergreen and will produce small yellow flowers in the springtime. Lysimachia is an excellent groundcover, a cascading plant in a combination planter, or a standalone hanging basket. It is also an aquatic plant and can be grown submerged for aquarium use. For best results with Creeping Jenny, we recommend using a constant feed program of 150-200 ppm N. Maintain a pH between 5.8 - 6.2. Lysimachia is a natural vine and a rather fast grower. We recommend that you pinch them 5-10 days after transplanting to your final container. They may require a second pinch to shape the plant for your final needs. For hanging baskets, an average pot will need to be spaced at 2' centers. If you are growing them for landscape use in an 1801, be prepared to control growth through proper pinching. Creeping Jenny are not responsive to plant growth regulators. Use proper pinching to control growth. Whiteflies, aphids, and spider mites are the biggest pest problems with Lysimachia. Lysimachia Golden is not prone to many diseases, but don't oversaturate the soil. If the plant sits in moist soil for an extended amount of time, you could end up with root rot or botrytis. Botrytis grey rot is usually associated with wet or humid conditions. You can prevent botrytis by allowing the plant to dry out between waterings, allowing for good airflow in your greenhouse, and spacing to allow the sun to penetrate to the soil level. The most common chemicals used to treat botrytis and root rot are Medallion and Banrot. Use them as a drench according to each label's instructions.